Kondratieff (Kondratiev) was a great Russian scientist who discovered the 50-70 year cycles in market economies in his 1920’s works. For his failure to proclaim the death of capitalism he was arrested and eventually executed by the communist regime. What you can read below is an old version (early 2007) of the article about Kondratieff Wave. Please visit this link to read the more up-to-date (2008) version about Kodratieff Wave. As you can see, the current K-wave, which started in 1949 with 2.5% yield on 10-year Treasury note, finished the leg up with absurd 15%+ yield. Currently we are in the down leg with 10Y/30Y bouncing around 4.7%-5%. This leg will be completed when the yield goes down to 2.5%. Here the consumer mortgage debt is used as a proxy for the 60-year trend of rising debt levels, which finally reached the absurd levels, as it should. The current Kondratieff wave will be completed when the mortgage debt will collapse back to historic levels of the start of new wave, i.e. 10%-15% of GDP. 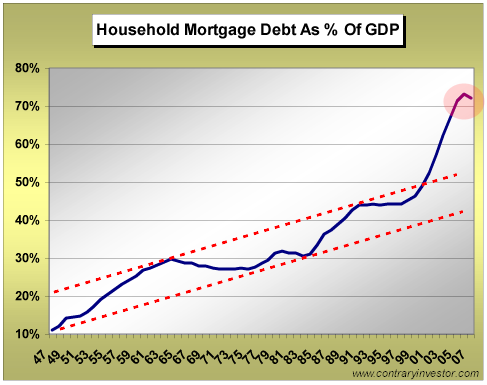 Obviously, it means that $4-$6 trillion of outstanding mortgage debt will end up in default, which means many millions of homes will foreclose and losses will devastate the banking sector. Unwinding of that debt back to 10% of GDP will complete the cycle. 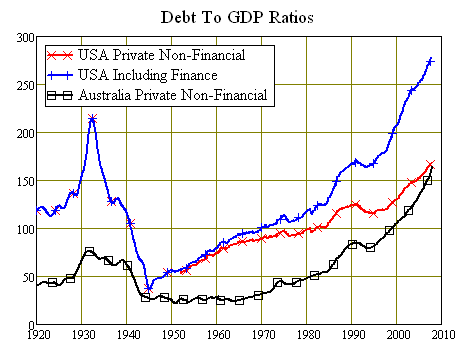 Above is another illustration of the same trend: debt piles up and then defaults in 50-70 years cycles. I think the length of the Kondratieff wave (50-80 years) is fundamentally related to the length of the human life, as every cycle is repeating the human mistakes made in the previous cycle. As the pop of the housing bubble and accumulation of the credit bubble in 1920’s is not witnessed by any of the currently living people, the pumping up the bubbles was cheered and celebrated as it was back in roaring twenties. The Spring starts after the devastation of the Winter of the previous cycle. At this moment the balance sheets of corporations and individuals are quite healthy, the debt level is low, consumption is low and well below incomes. The newspapers will call that “the nation of savers“. For example, one can hear a lot about Japan being “the nation of savers” in 1990’s and 2000’s. In fact there is nothing special about Japan, they entered their Spring season of the K-wave in 2006 and they are saving a lot because that’s what Winter and Spring seasons are all about. In Spring the economic expansion is moderate, the necessary increase of monetary base to cover the bigger economy needs is covered by modest debt growth and modest monetary inflation. The Summer period is 1966-1981. The growth is pretty good, but the inflation finally gets out of hands. 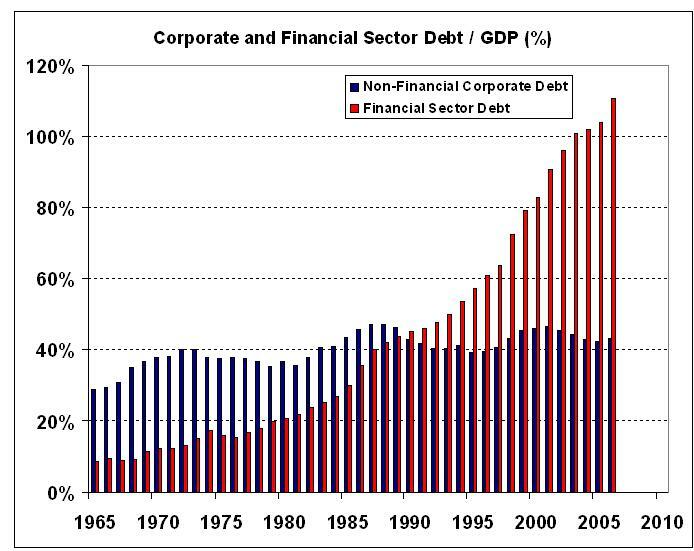 The growing inflation makes debt servicing problematic, which prevents individuals and corporations to take too much more debt. But the economy needs money, so the Feds are forced to turn on the printing press as they just can’t force more debt into the system. 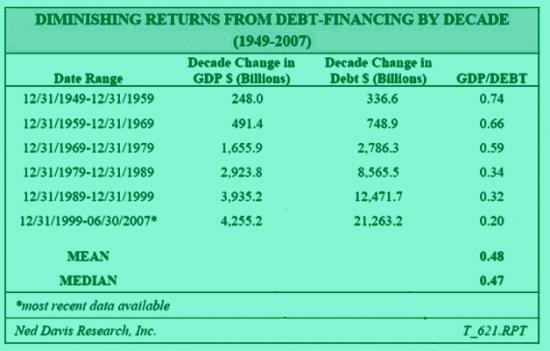 Obviously, the rampant inflation makes the debt servicing even more problematic, which creates a vicious cycle of Feds printing more and more money. This period is the best. US economy is enjoying it from 1981 t0 2007, 26 years of fun. Autumn is a debt bonanza. Falling inflation and interest rates allow consumers and corporations load up debt without increasing debt servicing obligations. Feds are happy because they can slow down the money printing machine as now banks and broker-dealers can create money all by themselves, without the Fed help. Feds are also happy because it’s very easy to control inflation. The debt load is so big that slight changes in interest rates can accelerate or slowdown the economy as desired. It is important to differentiate that while in Summer stage money supply is growing in an inflationary way in Autumn it’s all just leverage (or debt). Money is a claim for goods, leverage is a claim for money. The banks are creative in the ways they create leverage, as they can’t physically print the currency with the president faces. Instead, they create all kind of derivatives, collaterized debt obligations, mortgage-backed securities and stuff like that. It’s a big fun to print those papers and collect fees! It is very important to mention that during the Autumn the increasing number of borrowers (individuals or corporations) are becoming the Ponzi units. Ponzi borrower is the one who needs a constant increase of its debt burden in order for new debt to be used to service the old debt obligations. Usually it works fine as the assets used as debt collaterals are exploding in price. Until they don’t. Autumn is typical for all kind of bubbles. For example, the 1920’s in US were famous for real estate bubble, credit bubble and stock market bubble. It was very bubbly time. All the fun must end. The last Autumn bubble will eventually pop. The reason that bubble pops is not the increase of interest rates or any other Fed mistake. Feds do it all right. The bubble usually pops on its own weight, because the increasing number of Ponzi units need a constant increase of debt to stay solvent. Eventually creditors go to strike and deny the new credit. At this time the collateral used for the debt is falling in price, because the music stops and there is no enough chairs. This is called the Minski moment, when most Ponzi units are denied new credit all at once. The collapsing credit is essentially equivalent to the collapse of monetary base, because the debt obligations are essentially money, or at least very similar to money. The collapse of money supply is called deflation. It leads to the decrease of all kind of prices – goods, real estate, labor, stock market. There is no enough money and too much goods competing for money. It’s a time of oversupply. Too many factories, too many factory workers. Too many farmers, too many oranges. Too many banks and too many bankers. Too many homes and too many defaulted homeowners. The solution to the problem is massive elimination of all excesses. There are massive defaults, bankruptcies and foreclosures. There are ghost towns with empty homes. People are laid-off because they are not needed. How to fix that? Very smart Ben Bernanke suggested that he can drop money from helicopters. He is very smart and he had sent a very clear message to those who listen. The only solution to the problem he knows is to use helicopters. The only solution. So, if indeed he does not plan to drop money from the sky then there is no other way to fix the problem. I don’t know the way either, and nobody knows, because there is no way. The Winter of K-wave has to happen the same way as the winter happens in the nature, every single year. The main idea of Kondratieff was that the market economy self-heals itself each time it goes into trouble. USA was the strongest country in the world in 1929, and it still was the strongest country in 1940’s, after the Great Depression. So the Great Depression does not break the economy, it heals it. The idea is that all the bad debt must be eliminated, which probably means that pretty much all debt must be eliminated. The nation of spenders is converted into the nation of savers, which can export more than it imports, which produces more than it consumes, which saves more than it spends. Let see the relationship between stocks and bonds in different phases of Kondratieff wave. First of all let separate corporate bonds and government bonds. The yield of corporate bonds is composed from inflationary issues and credit risk issues. The yield of Treasury bonds are composed from inflationary expectations and some geopolitical issues, but mostly it’s just about inflationary expectations. The relationship between corporate bonds and stock market is easy. When yield spreads are widening, the stock market will drop – immediately or with some delay. When yield spreads are tightening back the stock market is bullish or is about to become bullish. That’s pretty much it. The relationship of Treasury bonds and stock market is much more interesting. Why is that? In inflationary context the main problem is, you guess it, the inflation. So when the economic expansion is maturing the inflation heats up and bonds are turning bearish. The peak of inflation requires a violent credit tightening from the Feds, which is producing the economic contraction and bear market in stocks. When bonds are finally turning bullish it usually means that the Feds can finally relax the credit and money supply and the stock market will signal that the next economic expansion is underway. In deflationary context it’s all different. Then the main problem is deflation, not inflation. The inflationary phase of the economic cycle is pretty relaxing and does not threaten the economic growth that much. People don’t even understand why the Feds are fighting that inflation when the things are so good. 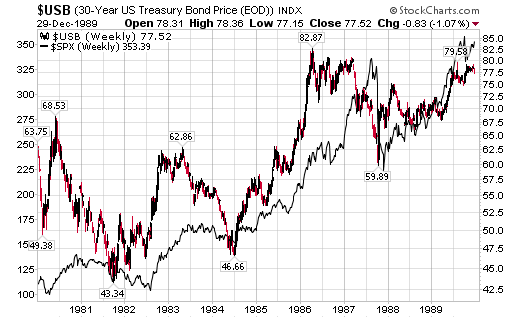 So the booming commodities and stagnating Treasury bonds are not bearish at all. New unprecedented heights of the oil prices are coincident with new heights of the stock market. That was not the case back in 1970s. But things become quite different when treasury bonds are becoming bullish. In deflationary context it is signaling that the happy inflationary period is over and the ugly deflationary period is about to start. The stock market will not drop right away as all the classic books written during the inflationary context tell that rising Treasuries are bullish. But that’s wrong, which comes as a surprise. In the deflationary context the bull market of ultra-safe Treasuries is soaking up money from everything, from the stock market, commodities market and real estate market. When the safest possible instrument is so bullish – why would you risk your money in the stock market? Based on above, we can determine the approximate dates of entering the new Kodratieff Winter in the first decade of new century. The detailed charting and analysis is presented in this post. 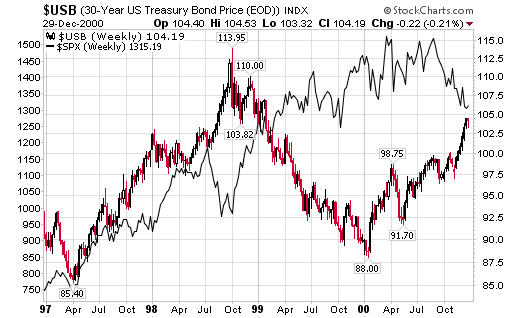 You can see that in 1980s and 1990s stocks and bonds are usually moving in the same direction, with bonds slightly leading. 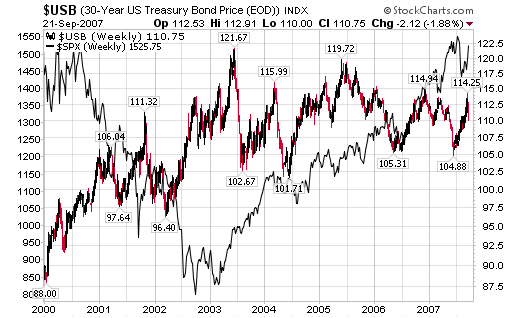 The stocks and bonds diverged in December 2006 until August 2007, then briefly synchronized for 3 months and finally broke apart in October 2007. The above charts show that Winter has hard time to start due to high awareness of Federal Reserve about a possible deflationary tailspin. Both Greenspan and Bernanke did everything to postpone the day of reckoning as far into future as they can, most likely making the matters worse when the gravity finally wins. Very nice article. Great summary of the mainstream K-wave publishers, too, so rather in the herd-thinking, if you ask me. I also follow the Kondratiev or Long Wave. For me, however, the cycle is always 54,3 years long. Staring from the last wave in 1949 this means it bottomed in April 2003. (The cycle earlier was 1896-1949) If you go back 1949, 1896, 1842 etc. you’ll find it correlates well to the troughs in interest rates – this is the primary indicator. From where I’m at, we are already in the 4th year of the new inflationry expansion, just as in 1953 the last time. As from 1949-53, the stock market and RE market have been expanding very strongly and the shift in the corporate and commodity area is that from an oversupply to and overdemand – and raising prices. We also experience strong gains in productivity, which can be expected in the early phase of inflationary expansion. Eventually, higher rates and a sense of corporate flubbiness will kill this, but that’s more than 10 years away. I expect the inflationary high of the current cycle in the mid-2030s. My understanding is that almost all who use the K-wave interprete it as still being in the winter phase as we did not see a Great Depression-style contraction. 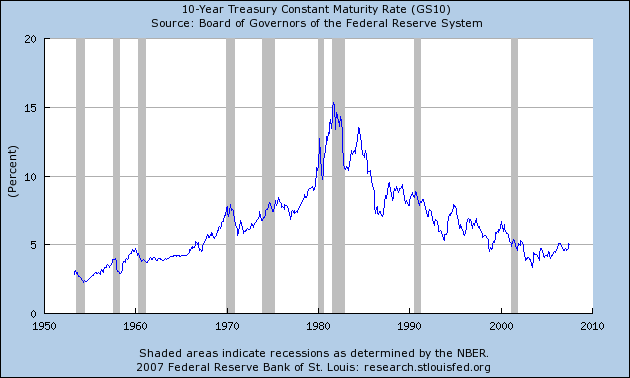 This is not necessary for the cycle to bottom, only a low in interest rates. Interest rates have recently broken through the down trend since the early 1980s. This is a confirmation for me. Additionally, the majority is always wrong, in which we agree as thinking outside the herd – and in the case of the K-wave this means for my to interprete it as beining in the spring phase. Optimistic Joe – both charts I’ve posted point strongly to the fact that we are in the Autumn phase. I don’t like any speculations that may not be supported by charts. The first chart must go to 3.5%. The second chart to 15%. Excellent Theroxylandr. Matches with the “Fourth Turning” by Strauss and Howe. The winter winds are starting to blow. Der ist ein großer Artikel! Kondratieff seems to have a good, simple handle on things. It’s easy to get distracted by all the jargon these days. Thank you. Thank you. I like simple, beautiful charts. If you scan my blog all the charts I post are very simple. We all saw real estate market tanking since almost two years now. Commercial RE has followed the residential since two months now like a waterfall down. (REIT) Stock market has started declining just before two weeks to a serious plunge that didn’t happen in last five years. Last Friday we saw that labor market has started showing signs of weakness the first time since labor market reports three months before that were mostly all strong suggesting strong labor market. Now, if we are still in Autumn phase then when do you think the winter will start? Please don’t just say ‘The first chart must go to 3.5%’. Basically I am trying to figure out when can I short the stock market to hedge against? Disagree totally. The majority is not always wrong, that is a misstatement of contrarian theory which holds that the herd is USUALLY wrong at key inflection points. Often the herd is right, especially during the big boom phases of a financial mania when the herd itself creates the big move. More importantly, people live longer now and therefore the wave itself is also longer. The wave as it applies to the current situation is based upon a concept that people alive today have no recollection of the run-up to the Great Depression (1920’s) and therefore have no clue as to the danger that we are in. This makes sense and one would expect each season to last longer while people live longer. The same is true of the 4-year business cycle, which STILL has yet to make a 4-year cycle low, even though some insist the low was last June, or that the cycle doesn’t even exist because it is so long! No, these cycles do exist, they are based upon human psychology as you know. Each person that lives to 78 or so can be expected to experience each season. There’s an old saying that goes something like this: if it looks like a dog and smells like a dog and barks like a dog, it’s a dog. Today resembles exactly a late Autumn credit environment and 2002 didn’t resemble a K-Winter at all. Therefore you know this cannot be the start of Spring and must be the end of Autumn as theroxylandr describes. JMHO. Tushar, I don’t know when exactly Winter will start. The economy is getting weaker but it still holds. With regard to interest rates, why do you say it peaked at 14.5% when it looks like on the chart that it broke beyond 15%? I’m not trying to nitpick, just want to make sure I am not missing something. Thanks very much for the article. Vern Kleegleman, I’ve replaced the chart after the article was written but did not adjust the text. 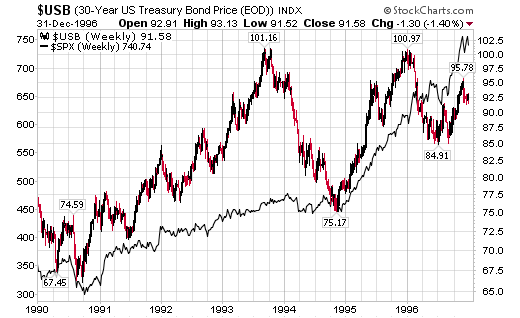 The previous chart was covering 30-Y bonds, I think. I will adjust the text. Thank you for pointing out the error! IMHO the bottom wave will come around 2017 to 2019. Based on a count from year 2000.The stock market could go as low as 8,000. I dont think it will be stocks that crash this time around, they will be kept at artificial levels at all costs.. However housing as we see in the states will be allowed to crash, after all they (the state) can then blame banks or the people who borrowed the money to finance the housing.. Yes it is a good thing, not so good if you lose your house, however if all around you are losing their houses too, then it is not such a bad thing, granted it will be hard to start over, however you and everyone is.. so you are not alone.. I think the UK property market will crash 50%, we are already into the crash cycle prices are dropping, just not at a fast rate yet, that will be after christmas… when debt laden people will simply need a way out..
winter hasnt come yet but lambs are being born, daffodills are shooting out the ground and the flowers of spring are nearly with us, winter, perhaps blame it on global warming, longer life span, or call it a naturalistic fallacy,however i tend to agree that most financial and economic patterns are linked fundamentally to a human and earthly psyche. the wheel is turning …..
Reading today on Jan 21, 2008 – before Tuesday that is supposed to bring a collapse to Wall Street it makes for a fun reading … particularly the comments that folloed in Aug-Nov 2007 – …. everything seemed not so bad. Now June ’08 and gas prices are through the roof in the US, that’s the topic of nightly news for months now, plus all kinds of individual factors that different interest groups are pointing to as evidence of a recession or coming ‘winter’. I’ve followed some Harry S Dent material to learn more on this subject, but don’t know much more about the real ‘theories’ and calculations required to figure this out. This content, here, is helpful in furthering my understanding of this. I only learned about K-waves yesterday when my Dad sent me an article about it. For this past October 2008 week, I’ve been wondering if I should ignore the advice to “wait it out” and leave my 401K in the stock market. I have lost $5000+ in the past 2-3 weeks. At age 52, is this good advice at the beginning of winter? Will the next spring start soon enough for me to make back my money before retirement? Or should I pull it all out now while I’ve got a “bird in the hand?” Thanks for this article. It helped me understand this complex topic much more quickly…sort of! This is 11 octobre 2008, i think that the winter is coming just begining! dow is 8000 just now!! unbelievable!! I had to admit it it all fits! and i´m a bit affraid of what´s coming. And holy cow! It all fits, as Nief says. The crash of October 2008 is the exact equivalent of the crash of October 1929, and we appear to be headed for the exact equivalent of the Great Depression: 6 to 10 years of deflation. Your article is great because it shows how Greenspan and Bernanke managed to stave off the onset of winter – but it came anyway. Bernanke is still hoping to save the economy with massive injections of money, which might work, but at the price of galoping inflation. I learned to my amazement that Bernanke is considered the greatest living authority on the Great Depression – so that is why they named him! It seems a lot of people may have been perfectly aware of what was coming. >>> I learned to my amazement that Bernanke is considered the greatest living authority on the Great Depression – so that is why they named him! It seems a lot of people may have been perfectly aware of what was coming. But they never (almost never) mentioned that in public. I first learned of the K wave in mid 70s and then mostly forgot about it. In 1926 Kondratiev suggested a 54 year cycle. At that time the life expectancy was about 54 years. It is now 79 years after the crash of 1929 and the life expectancy is about 79 years. Do you think there is a correlation here? Is the K wave a predictor of more than economic cycles? >>> It is now 79 years after the crash of 1929 and the life expectancy is about 79 years. Do you think there is a correlation here? I think it’s impossible to tell. Only 3-4 completed waves happened in U.S. history and I doubt we can track that in Europe for more than 3-4 cycles as well. Statistics is mute here, the event must repeat many times to make any conclusion. I think the true length of K-wave is simply unknown yet. I have been watching since last january. So far i am up this year bt trading the market. Now the swings are too wild and irrational. Personally i believe the bailout money is being used to sustain the markets via the bank bailouts. Banks are using the money to buy and sell stocks maintaining the status quo. The question i have, since the wave travels from economy to economy, wouldn’t we be wise to say buy japans and china stocks and stay away from US stocks? Wouldn’t this keep personal income savings moving up? Call it market jumping. И как же это можно понять простому человеку? Самое важное – уметь отличить важное от срочного. Никогда не спорьте с умным: люди могут не заметить между вами разницы! Cool information. If you have free time, pleas came to my site. Thith is it – spades game. Do you want know your your ip address – for free? The deflating money supply dwarfs FED efforts to reinflate and this is just the beginning. Nation of savers will come true according to Prechter. Rummage through this person’s posts and you’ll find more about the Kondratieff Cycle than you will believe. If your into investing into penny stocks then I would advise you stay clear from pennystocks.com. [b]I got burnt BAD by these guys[/b]. Not sure how they are the only penny stock site recommended in Barron’s and by Forbes. I would light a torch to Forbes if they referred me to these [i]scammers[/i]. Thank you so much for this. Im currently studying business management at university and im revising for a Business Environment exam. I really didnt understand the wave until i read through this.. I have to now link to to product innovation cycles! The simple reality is that the Kondratieff wave can’t be overridden – and the tail end of the Kondratieff wave involves deflation and depression. In fact, the very transition through the later phases of the Kondratieff wave involves high consumer price inflation going to low consumer price inflation eventually going to zero consumer price inflation (which we have had a whiff of already, despite the Fed’s best efforts) followed by negative consumer price inflation, i.e., deflation. I visited your website for the first time last night and I noticed that you had some investing resources. You’ve done a great job with your website and I was wondering if you might consider listing my penny stock blog as a link on your website? I’d like to be associated with some of the better websites online like yours. I am an expert on penny stocks, penny stock trading and penny stock picks. I would be happy to write an article or contribute some sort of content to your website as well if you would be interested. Description: Xtremepicks.com is an informative blog dedicated to helping people manage the risk of picking the very best penny stocks available today. If you are able to link to me, I would appreciate it if you could let me know so that I can see the link. If you can’t, I understand. Thanks for reading this and I’m glad I found your website. Buenas!Me gustaria comentar que lo que expones en tu pagina es a la misma conclusion que he llegado yo. I am going to watch out for brussels. I’ll be grateful if you continue this in future. Many people will be benefited from your writing. Cheers! Hi it’s me, I am also visiting this site regularly, this site is really good and the users are genuinely sharing fastidious thoughts. AOL? I need a specialist in this house to unravel my problem. May be that is you! Taking a look ahead to peer you.